Appropriate screening and diagnosis can improve outcomes of diabetic neuropathy. Diabetic peripheral neuropathy is a significant source of morbidity and mortality and is implicated in approximately 50% to 75% of nontraumatic amputations.4 It has been defined as “the presence of symptoms and/or signs of peripheral nerve dysfunction in people with diabetes after the exclusion of other causes.”5 This article presents an overview of diabetic peripheral neuropathy, but it is important to remember that diabetes is not always the cause of nerve dysfunction in patients with diabetes in whom it develops. This article reviews the entities to be considered in the differential diagnosis when a patient with diabetes undergoes an evaluation for peripheral neuropathy; in addition, we review the risk factors for this condition, as well as pathophysiology, signs and symptoms, diagnosis, screening, and treatment of diabetic peripheral neuropathy. In making a diagnosis of diabetic peripheral neuropathy, it is important that the examiner consider a variety of entities because in 10% to 26% of patients with diabetes who experience peripheral neuropathy, another underlying cause may be present.6 Making the proper diagnosis requires a careful clinical evaluation and laboratory testing. Electrodiagnostic studies or nerve biopsy may be needed if the diagnosis remains unclear. 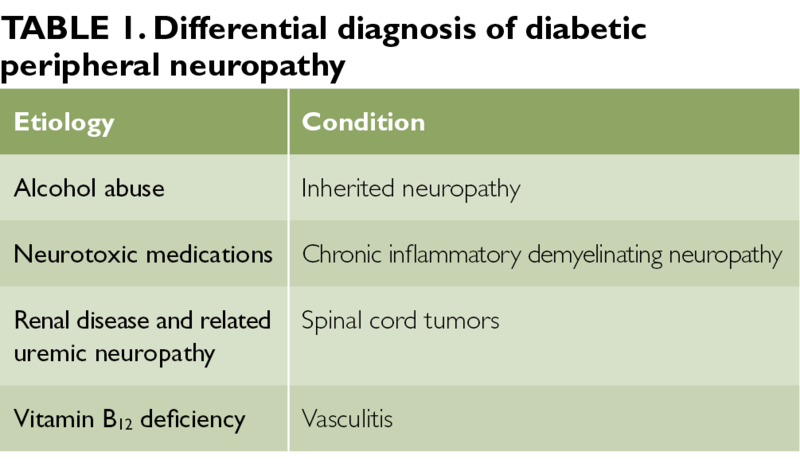 Potential nondiabetic causes of peripheral neuropathy are listed in Table 1; however, this list is not exhaustive. Mechanisms underlying the development of diabetic peripheral neuropathy commonly cited in the literature include the polyol pathway, advanced glycation end products, and oxidative stress. In this section, each of these mechanisms is described briefly.